Everything started while I was first reading this interesting GB (and FL-mod) topic. As a newbie in flashlights I am (I started reading just a couple of days ago), plus not speaking english as native language, I couldn't understand which part called "a-b-c" corresponds to "x-y-z" picture. I had to google for every part name I was reading in order to see it's picture and understand. That's why I decided to find a picture of a flashlight, showing most of it's inner parts and simply add their names (terms) in the picture. Then I've realized that the flashlight in the topic (Brilyte B158) has some parts that are different from other flashlights. The main difference in the modding procedure is the pill and the driver. So I've added some more pics, showing a couple of pill & driver variations. Driver (BLF A6 A17DD-L FET+1 2.8-4.35v 7/4 Modes Flashlight Driver) with spring not "bridged"
That's all -for the moment- folks. I hope this topic will be usefull to flashlight ignorant newbies like me! The "blurry" pics are screenshots from mhanlen's youtube video. Sorry, couldn't do something better. Nit pick on the first image. Shouldn’t the part indicated by “tail cap” be the switch cover or boot and the threaded metal cover be the actual tail cap? Ok, but that’s not the impression I get when I read about people taking tail cap measurements, disassembling or battery lockout by unscrewing the tail cap. This is what I typically expect. kuoh, "tail cap" is 2 words combination: "tail" + "cap", meaning the cap of the tail. That's my understanding. If I'm wrong, I'm deeeeeeply sorry! Thank you very much for putting your guide together. Your English is far better than my Greek….!! kuoh, “tail cap“ is 2 words combination: “tail” + “cap”, meaning the cap of the tail. That’s my understanding. If I’m wrong, I’m deeeeeeply sorry! I would call the rubber bit a “switch boot”, though I’m not sure if this is just a UK term. Good idea of yours to create this thread to help us newbies! Thank you. I thought the bezel screwed on to the head, typically holding the lens down? I was also under the impression that the tail cap is either the part the houses the switch or the entire tail switch assembly, with the rubber/metal cover being called a switch boot or switch cap. This will be a good post for new people with some refinements, this might help too !! It really helps, thanks for your valuable contribution to this topic! Γεια σου κι εσένα φίλε μου! = Geia sou ki esena file mou! = Hello to you too my friend! Thanks for the welcoming and the positive thinking for this topic. I could try to translate the flashlight parts in Greek if somebody's interested! I would call the rubber bit a "switch boot", though I'm not sure if this is just a UK term. Good idea of yours to create this thread to help us newbies! Thank you. Well, I haven't got the slightest idea. Thanks for your kind words, I really hope this guide will help newbies understand easier what's what. I thought the bezel screwed on to the head, typically holding the lens down? I was also under the impression that the tail cap is either the part the houses the switch or the entire tail switch assembly, with the rubber/metal cover being called a switch boot or switch cap. 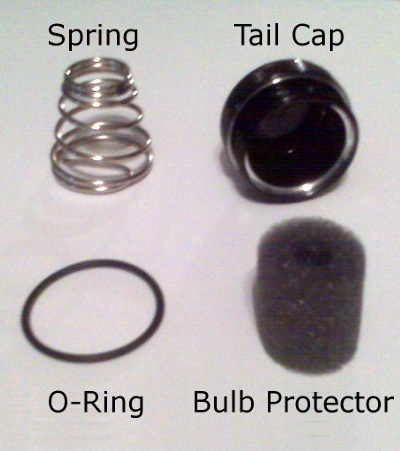 As I realize now, "tail cap" might be called just the rubber that covers the tail switch (as fasttech's search result in previous link), or the whole "tail" tube part of the flashlight (especially if there's no rubber at the tail, as in lots of flashlights). Where in Greece are you KGB? And what is your name? I’m Paul. My wife used to live and work in Greece before we met. We have lots of Greek friends, mainly in Crete, some in Athens. From my knowledge, the tailcap is the entire rear assembly that screws on the light. Compare the bottle cap. And yes, the switch’s rubber cover is conventionally called a “boot”.